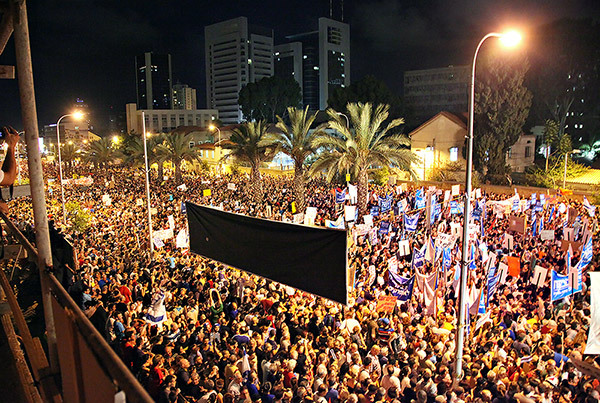 Editorial in the news (by Professor Y. Zair): The events of the last few days have shown that the Israeli society resists minimizing the government’s participation in managing the country because people want to live in a unified society that does not extol competition at any price, but supports mutual guarantee, care for one another, and a much more humane society. All of the classes are interlinked with one another. The youth is giving us a wonderful lesson of brotherly relationships between people. 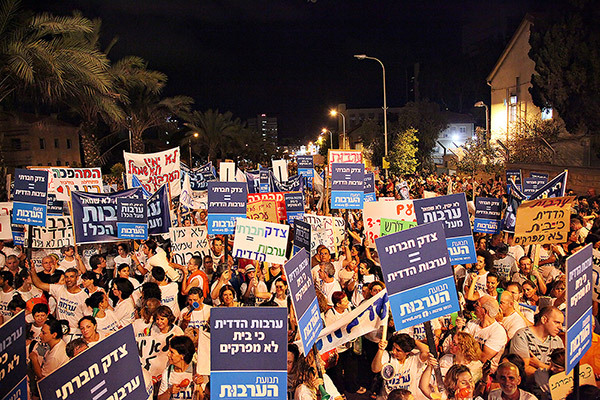 There is not a single party in Israel that proclaims equality as a value. 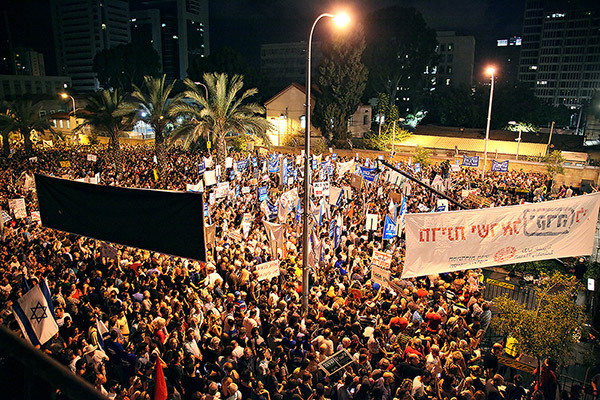 Perhaps the phenomenon we are observing in Israel is one of the first harbingers of a new, worldwide tendency. My Comment: All that’s left is to discern how to turn this tendency into new social relations in order to reveal the new, upper world inside of them. You Want To Involve The People? Then Educate Them! 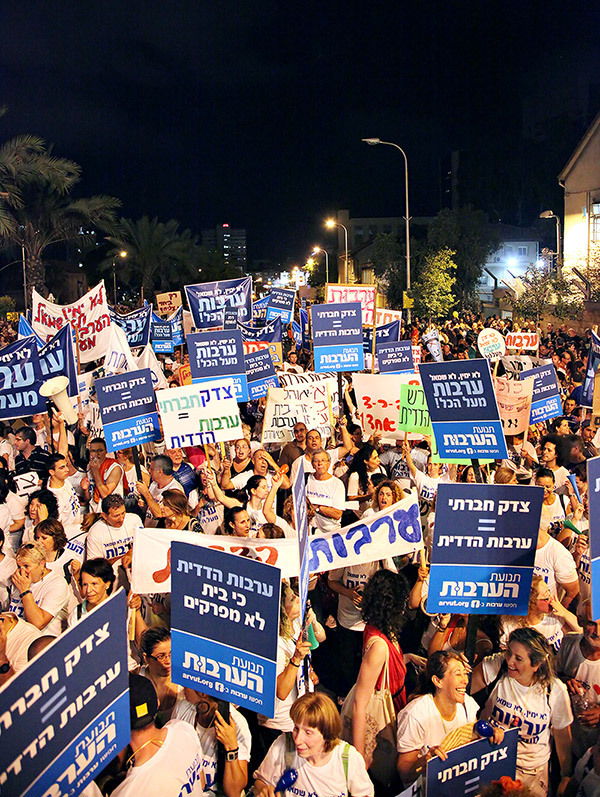 Last night, on August 6th, there were mass demonstrations held all over Israel, demanding social justice. 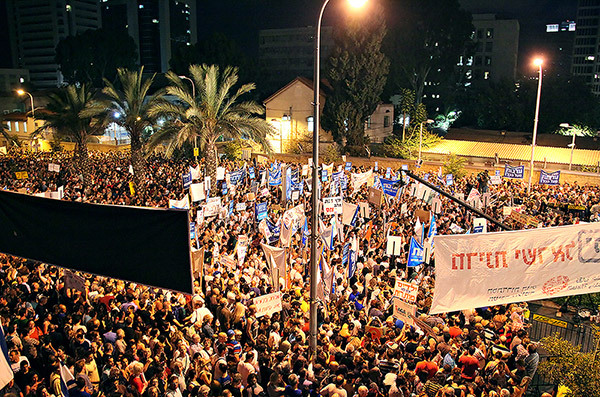 The central event was held in Tel Aviv, where hundreds of thousands of people came out to the streets. 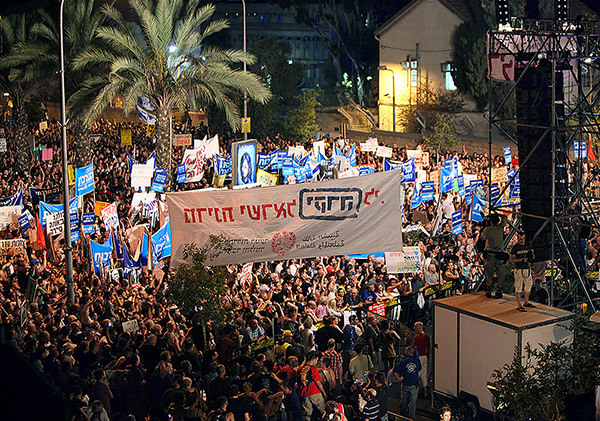 Banners of the “mutual guarantee” movement were visible in almost all of the photos and videos published by news agencies and shown in the news. 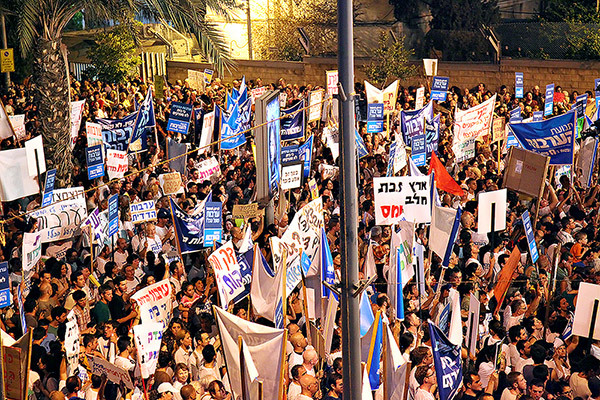 These banners, carried by several thousands of participants, appealed for justice and unification regardless of one’s political views. They proclaimed mutual guarantee as the highest value. 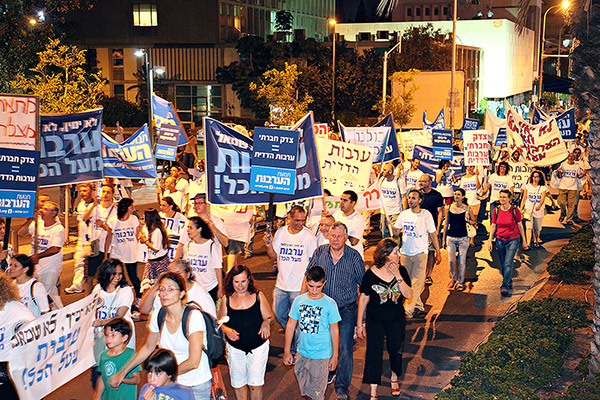 The event was broadcast live via radio and Internet. 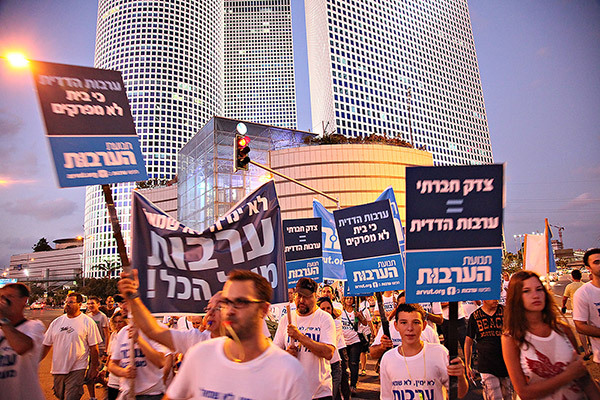 The “mutual guarantee” movement was founded by the “Kabbalah L’Am” movement. Its objective is to unite the nation, in conformity to the demands of the new era, as part of humanity’s process of becoming a single, integral whole. Today, the topic of the mutual guarantee which we proclaim is being vigorously discussed in the Israeli mass media and picked up by a wide audience. “Mutual guarantee” is gathering momentum! The only way we can come closer to observing the principle of love thy neighbor is under the condition of mutual guarantee. And to reach it, we need to follow Kabbalists’ advice to the point; otherwise we won’t succeed. Baal HaSulam writes in one of his letters that if a person even slightly deviates from the right path, the further he goes along, the greater his deviation and mistake becomes. It’s in this way that he completely deviates from the direction towards the goal, although he doesn’t feel that he has wandered from the path because he deviates from it a little bit at a time. But in the end, all these deviations add up and become one big, bitter mistake. This is why the people who decide to go towards this goal must have an order, a charter. It is as Rabash writes: “We have gathered here to establish a society…” And the principle is for everyone to connect with the purpose of annulling oneself before the rest, above all the obstacles and disturbances that come from Above, the upper force, whether we see it or not. This is why everything that happens to us comes from Malchut of the world of Infinity. That is the only place we must turn to for help—the form where we exist as one man with one heart, full of revelation of the Creator, the Light, according to our similarity to Him. And the rule of “Love thy neighbor as thyself” is the law of existence of the collective soul which exists in the world of Infinity. This is why this law really is a “great, general rule” or, as Rabbi Akiva has said, a huge vessel for all the infinite Light that becomes revealed in it. Opinion: (Alexander Paliy, political scientist, gazeta.ua): “The impact of the mass murder in Norway on Europe will be twofold. Society and security agencies are now forced to keep track of the psychological characteristics of people with different political or philosophical orientations, restrict their activities…. My Comment: Everyone should learn the fundamentals of behavior in similarity with the nature of an integral global society intolerant of narrow egoism, nationalism, or any manifestation of egoism as a vice destroying humanity, like a cancerous tumor in the human body. The introduction of such upbringing for the whole society must become the main task of the state. Baal HaSulam, The Study of the Ten Sefirot, Part 1,“Table of Answers for the Meaning of the Words,” Question 48: Who is “near” (Karov)? The closer one’s Tzura (form) [desires] is to another, the closer they are considered to be. Distance and closeness are evaluated only according to the equivalence of form, the correspondence of properties. But the correspondence of properties does not mean that I am identical to Him. After all, I cannot change anything within myself. But depending upon how I use my properties, desires, and how similar they become to how the other uses his or hers, we measure our closeness accordingly. One can be very big, while the other very small. But if the one who is small desires to acquire the same shape as the big one, he is viewed as someone who is close to the latter, who cleaves to him and is situated in his hands or inside of him. All of these are different degrees of connection between spiritual objects (Partzufim). One can be found inside the other if he completely cancels himself and agrees to allow the upper one to work on him all the time, while the former just needs to find the strength to renounce himself. This state is the most familiar to us and is regarded as “embryo.” It is the stage of initial ascent to higher spiritual degrees. Once he is born, it might seem that now that he is outside: It’s not such a strong bond, like the one that existed inside. But being on the outside, he supplements the connection that he had inside with his egoism which is now corrected. And so, although he is no longer an embryo but a “small” child (Katan) sitting in the adult’s arms, he cleaves to him evermore. His seeming existence apart from the big one is only the external form. But this difference shows us the corrected ego which can exist even outside of the upper one, and yet remain attached to him. The third form is when he is no longer in a state of “feeding” (Yenika) in the upper one’s arms, in a small state (Katnut), but transitions into adulthood (Gadlut) and stands next to the adult. And then he already has his own “body” and a world. Between them, there is now a distance which does not bind the two by any “umbilical cord” or feeding. However, all this separation is only in our eyes, while in a spiritual state this means that he has reached an even greater connection, a new form of adhesion. Even existing totally apart from the upper one, he merges with him completely. After all, even all these desires that seem to exist outside of each other are unable to separate them. These are the stages we go through: embryo, feeding, and maturity. But it all begins with a total self-renunciation, when one struggles to override all obstacles that separate one from the upper one. 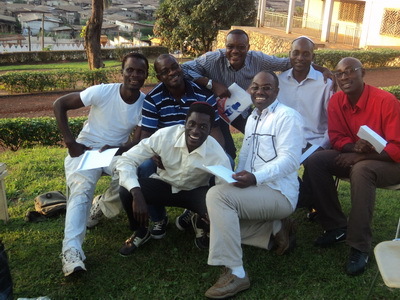 A note from our students in Cameroon: We gathered on July 31, 2011 to participate in the “Unity Day” via the Internet. But as you probably know, this technology does not always work, especially here in Cameroon. Yet, this did not stop us from connecting with you. Our hearts and thoughts were together with you. We are in the process of registering a non-profit association. We hope that in the coming months all the documents will be finalized. We embrace you all and hope to see you soon in Cameroon, to organize a big campaign to disseminate Kabbalah worldwide. Opinion: (Harold James, Professor of History and International Affairs at Princeton University, Professor of History at the European University Institute, Florence, the author of The Creation and Destruction of Value: The Globalization Cycle): “Crises, especially very severe ones, are often learning opportunities. Unfortunately, so far the world seems to have learned very little from the recent financial crisis…. “We do not know how to handle the fiscal issues posed by the financial crisis…. My Comment: The error is that they think they know the causes of the crisis. Hence, the solution is incorrect. The cause of the crisis is that humanity “flopped down” from a fragmented system into a single, integral one, but its leaders continue to operate by the old methods due to inertia and a lack of understanding of the new state of the world. First, they have to imagine the new world as a single closed system, entirely interdependent, as one family. And on this basis, they should begin to solve all the regional, national, and global problems. They must find complex solutions, together. A global, mandatory, and integral education should be the main item on the agenda so as to provide knowledge about the new world to each citizen of the planet. To do this, it is necessary to use all of the media, to require complex integrated knowledge to obtain a certificate of completion of the 1st, 2nd, and so on courses. Only by raising the masses to the level of knowledge about the modern laws of society will it be possible to understand what is happening and to carry out any social reforms. Question: According to the description of the “language of branches,” which defines the relationship between the root and the branch, it appears that these are certain forces or even fields that connect different states. Answer: A field of energy is a certain state. Indeed, the language of branches connects together the field or domain of reception with that of bestowal. Every word is intended to indicate the path from one state to another and to take us from one state to the next. It follows that the language of branches doesn’t explain something in one plane, whether in this world or the upper one, meaning in the plane of reception or the plane of bestowal. Rather, it shows you the path, it as if drags you away, wishing to take you from the state of reception to bestowal. The main distinction of this language is that it takes us to another level, whereas all other languages remain in the same plane and don’t trigger an ascent to the next degree. The language of branches is called such because it aspires to raise you from the branches to the roots. It is built like a lift or a crane. That is why it indicates the spiritual root and also holds its complete cipher: TANTA (Taamim-Nekudot-Tagin-Otiot), the inner data of the root. Baal HaSulam, The Study of the Ten Sefirot, Part 1,“Table of Answers for Topics,” Question 56: What is the ordinary language in the wisdom of Kabbalah? This language is a “language of branches” that points to their upper roots. That is because “You haven’t even a single blade of grass below that has not a root above.” Therefore, the sages of the Kabbalah have put together a language that is equipped to imply through the branches and teach of the upper roots. There are no words that we hear or read in Kabbalistic books that don’t lead us upwards! In this world, we are able to express any concept in various ways: hearing a word, seeing it written, or saying it out-loud, but the essence of the word will still point to its root. In other words, the language of branches doesn’t represent the root or constitute its material branch, but rather it shows us the attitude of the branch towards the root. Each word points from the bottom to the top, meaning from the property of reception to the property of bestowal. Obviously, the words “down” and “up” do not imply position in space, but signify qualitative notions. When perceived in the correct way, each word always tends to move us from the state of reception to the state of bestowal. The more we penetrate each word, the more it elevates us towards the state of bestowal. Each of us has but a single goal: [to unite] for Divinity [revelation of the Creator, the property of love and bestowal] to be among us. We must remember that the society was established solely on the basis of achieving love of others, and that this would be the springboard for the love of God.